Pannasastra University in Phnom Penh. A pioneering educational programme is helping deaf and blind children to integrate into Cambodian society and lead happy and fulfilling lives. Sinat, 27, who has been blind from birth, is one of the many success stories of the Krousar Thmey Foundation – an organization that provides learning opportunities for disadvantaged children. Meaning “the new family” in Khmer, the NGO originated in refugee camps in Thailand in 1991 and it currently operates in 14 provinces and is “run by Cambodians for Cambodians”. When she was young, Sinat lived in a pagoda and this restricted her education to informal teaching outside of a school environment. Fortunately, she was taken in by Krousar Thmey and enrolled in the foundation’s school for deaf and blind children. The school offers a daily half-day inclusive education starting from Grade Two for blind children and Grade Four for deaf children. During the other half of the day children attend a public school. “The best time of my life was when I learnt how to read and write Khmer Braille,” Sinat said. Thanks to the Khmer Braille created by the foundation in 1994, Sinat now has a comprehensive tool to learn and communicate and advance her learning. However, the school is more than a centre of knowledge for Sinat – it has also enabled her to overcome the loneliness she experienced as an orphan and develop socially. She has discovered a new world where children with disabilities can play, run and enjoy social activities enjoyed by other children. Every day, teachers help Sinat to develop her learning and life skills. 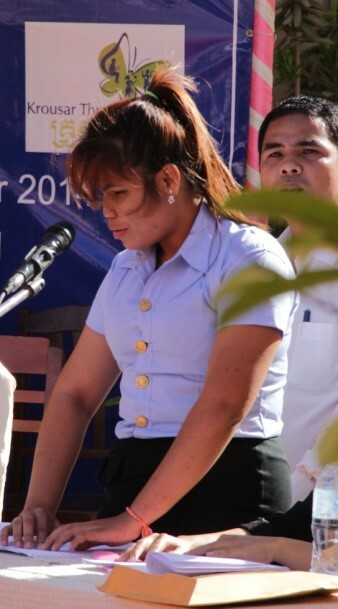 As well as Khmer braille, she also studies computer technology and English. Some of the teachers at the Krousar Thmey school are former students and their deep insight into the difficulties these children have faced enables them to provide superior support and an enhanced learning environment. Besides being understanding and attentive, staff are approachable even in the evening after classes have ended. Sinat is currently in the third year of her English studies course at Pannasastra University in Phnom Penh. Her education is supported by the Academic and Career Counselling (ACC) programme. The ACC programme was initiated by Krousar Thmey in 2010 to facilitate the integration of blind and deaf students into vocational training courses, universities and professional environments. Since January 2016, UNICEF has provided financial support for ACC’s activities such as individual counselling, orientation workshops, university and company visits, and awareness workshops for university students and potential employers. In Sinat’s case, ACC supports her with mobility and orientation sessions. Before entering university, visits are organized by the ACC to enable Sinat and other students with disabilities to get more familiar with the environment, such as the location of the toilets, lecture rooms, administration and other important sites on campus. Recommendations are also shared with university management to encourage them to make the campus more “visually impaired friendly”. These orientation visits also provide an opportunity to find one or several students who are willing to act as a mentor and facilitate a disabled student’s integration. Students who are not visually or hearing impaired also play an important role in helping their disabled colleagues with their ongoing learning activities. Krousar Thmey has also facilitated Sinat’s learning with the supply of important devices such as an audio recorder and laptop. Aside from her daytime study commitment, Sinat works in the evening at a restaurant called Dine in the Dark. The Dine in the Dark concept is to serve dinner in pitch-black darkness which is claimed to heighten a diner’s senses of taste and smell when the sense of vision is taken away. This experience also gives customers an insight into a blind person’s daily life as they become dependent on others to guide them through the dark restaurant. Sinat’s education has helped her carry out this supervisory role very successfully as she has to communicate with many of the customers in English as she takes them to the restaurant tables in the blacked out room. With fluency in the English language, Sinat intends to give back to Cambodian society as an English teacher after she graduates. Self-independent, confident and happy, Sinat is a role model for Krousar Thmey and she personifies why the organization works hard every day to provide underprivileged Cambodian children with the support needed to integrate into society as liberated and fulfilled citizens. “We should not be afraid to integrate deaf and blind children into Cambodia society. We can all contribute to the development of Cambodia,” Sinat added.